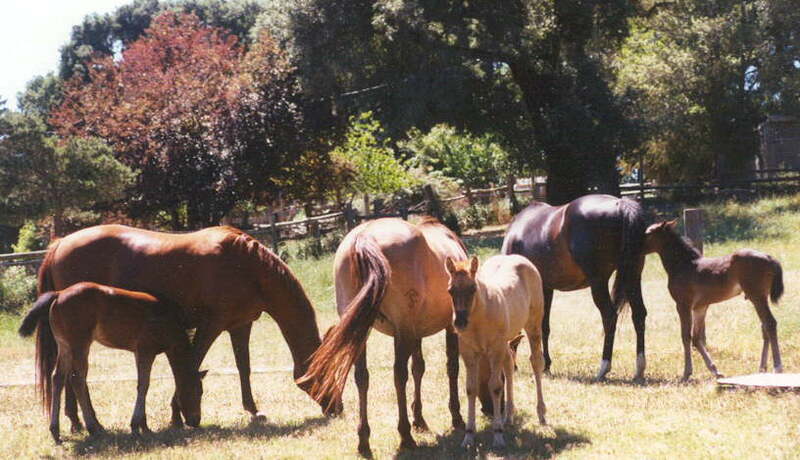 From the beginning, mares with working bloodlines were selected for the ranch breeding program. In 1964, two mares were bred to Doc Bar. One of the resulting foals was Smokey The Bar, born in 1965 to the foundation mare Chubber Cheeks (by Nevada King, by Lucky Blanton). Chubber's dam traced to Tony and King. Smokey was bred to ranch mares and a few outside mares, but not widely promoted to keep the ranch operation low key. Wyammy Holly, NCHA Certificate of Ability and dam of the Priolo's good stallion, Colonels Reflection. 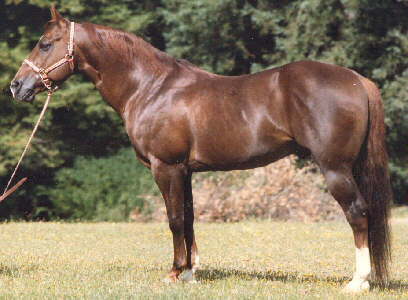 Fancy Wyammy, finalist at the 1976 Pacific Coast Futurity and dam of Tio Doc (by Mr San Peppy), 1982 Super Stakes Finalist and 4th in the Tropicana Futurity Finals. Chule Wyammy, High Point PCCHA Junior Cutting and 1979 WCQHA Junior Cutting. 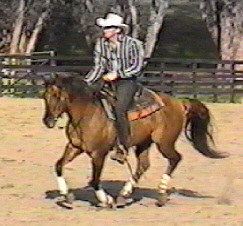 Choya Wyammy, son of Smokey The Bar and Merry Jinx, has been trained in reining by Art Grunig. Click the camera to view movie of Choya. Alegria and Andale (shown at the right) - two young mares out of Sangria (full sister to Choya) by Colonels Reflection -have lots of cow and athletic ability and are being successfully shown at cutting shows. 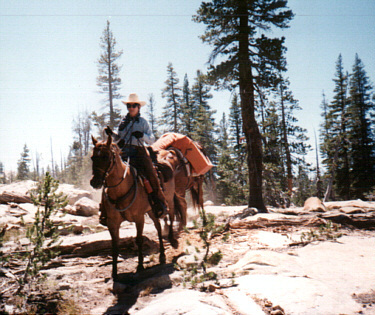 JoAnn has always believed in well-rounded horses and uses her horses on local trails and on longer treks packing in the Sierra wilderness. 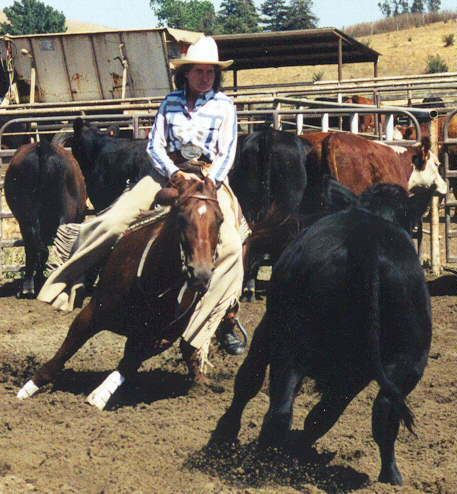 She provides her horses with variety and a chance to unwind from the pressures of training and competition. 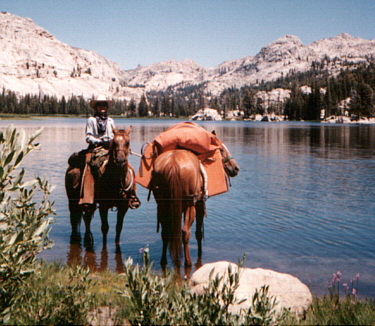 Her horses reflect her philosophy that a good-minded, sound horse should be able to do many jobs over a lifetime. 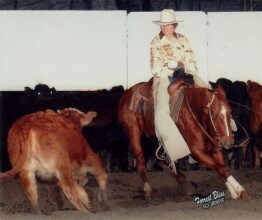 In testament to her horses' durability, JoAnn successfully campaigned her 21 year old cutting mare, Wyammy Sangria, in 1999 at local club cuttings. 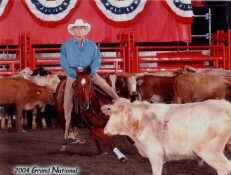 Wyammy Ranch is proud of producing high quality, sound minded and bodied, athletic horses. This site was designed by Wanda Smith. It was last updated on 8/27/07.